Nintendo and Versus Evil have announced that The Banner Saga trilogy of adventure games are coming to the Nintendo Switch. 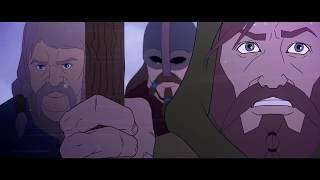 Banner Saga 3 is the conclusion to the Banner Saga trilogy of story-driven role-playing games, as players will need to brace themselves for tough battles, difficult choices and tragic losses. Banner Saga 3 launches this summer for the Switch. The original two games, The Banner Saga and The Banner Saga 2, are also coming to Nintendo Switch. Players’ personal stories, progress and choices from the first two games will carry over to Banner Saga 3. The Banner Saga franchise made its debut back in 2014.